For nine years and more than 200 episodes, ABC, Quinn Martin Productions and Warner Bros. presented an idealized version of the Federal Bureau of Investigation. It was the most successful series, in terms of longevity, for producer Quinn Martin. For ABC, the series was a solid element of its Sunday night lineup. For viewers? Well, they kept coming back. 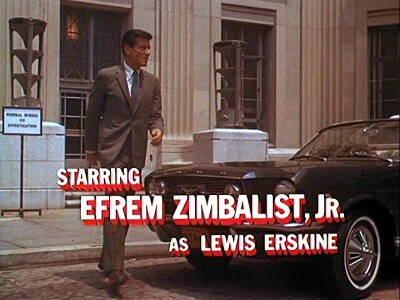 Inspector Lewis Erskine (Efrem Zimbalist Jr.) battled bank robbers, escaped felons, spies, saboteurs, con men, organized crime bosses and other foes. In an unsettled age (of which the real-life FBI was deeply involved), the television series The FBI was a reassuring presence. Without question, FBI Director J. Edgar Hoover kept a close watch on the series. (He died after the seventh season had been produced.). For additional information, CLICK HERE. You can also read The New York Times’s May 1972 obituary of Hoover by CLICKING HERE. Hoover, in particular, wanted FBI agents portrayed in a particular way. The bureau had two agents assigned to the show, including one on set. Major guest stars were subject to FBI approval. Bette Davis, who was a fan of the show, was rejected twice. For writers on The FBI, there was more flexibility in the characterizations of criminals and other characters. Quinn Martin entered the project with some reservations and said his own politics were more liberal than Hoover’s. For all that, The FBI has a certain gravitas. The series never “jumped the shark.” It often gave guest stars meaty parts. So get in your favorite model from the Ford Motor Co. (the show’s original sponsor and vehicle supplier for the series) and take a spin around the site. There are reviews for all 241 episodes. SEASON ONE (1965-66): Different from all other seasons, with a greater emphasis on Erskine’s personal life than would be seen during the rest of the series. SEASON TWO (1966-67): The series adds a narrator (Marvin Miller), providing a “voice of God” presence for the rest of the series. SEASON THREE (1967-68): Erskine gets a new partner, Tom Colby (William Reynolds), who would be the FBI man’s sidekick for six seasons. SEASON FOUR (1968-69): The show, now firmly established, showcases a future superstar actor (Harrison Ford) as Erskine and Colby continue their war against menaces of all kinds. The final season for Charles Larson, the day-to-day producer who had guided the series since its earliest days. SEASON FIVE (1969-70): Erskine enters the 1970s as a new day-to-day producer (Philip Saltzman) takes the reins of the show. SEASON SIX (1970-71): The FBI, the series, is on cruise control. SEASON SEVEN (1971-72): For Quinn Martin, if it ain’t broke, don’t fix it. For ABC, the series still is a solid performer. The last season to be produced while FBI Director J. Edgar Hoover was alive. SEASON EIGHT (1972-73): While the ratings start to slip, no major changes in direction although there are some adjustments behind the scenes. The last season with Tom Colby as Erskine’s sidekick. SEASON NINE (1973-74): Erskine gets a new, younger partner. Quinn Martin appoints a new day-to-day producer, Anthony Spinner, to shake things up. For the first time, the television version of the bureau has women agents. NEW (Aug. 12, 2018), THE CARS OF THE END TITLES OF THE FBI: From the classic first-generation Mustang to big, hulking cars, here’s what Erskine drove in the end titles over the show’s nine-year run. Inspired by FBI Cases but Incidents, Locales, Characters and Their Names Are Fictitious.